NMR rešenje strukture peptidnog mimetika četvrte citoplazmične petlje CB1 kanabinoidnog receptora, PDB 2b0y. ↑ Graham ES, Ashton JC, Glass M (2009). "Cannabinoid receptors: a brief history and "what's hot"". Front. Biosci. 14: 944–57. PMID 19273110. ↑ 4,0 4,1 Sylvaine G, Sophie M, Marchand J, Dussossoy D, Carriere D, Carayon P, Monsif B, Shire D, LE Fur G, Casellas P (1995). "Expression of Central and Peripheral Cannabinoid Receptors in Human Immune Tissues and Leukocyte Subpopulations". Eur J Biochem. 232 (1): 54–61. PMID 7556170. doi:10.1111/j.1432-1033.1995.tb20780.x. ↑ Matsuda LA, Lolait SJ, Brownstein MJ, Young AC, Bonner TI (1990). 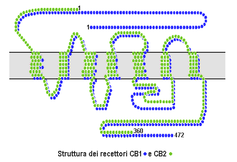 "Structure of a cannabinoid receptor and functional expression of the cloned cDNA". Nature 346 (6284): 561–4. PMID 2165569. doi:10.1038/346561a0. ↑ Gérard CM, Mollereau C, Vassart G, Parmentier M (1991). "Molecular cloning of a human cannabinoid receptor which is also expressed in testis". Biochem. J. 279 (Pt 1): 129–34. PMC 1151556. PMID 1718258. ↑ Begg M, Pacher P, Bátkai S, Osei-Hyiaman D, Offertáler L, Mo FM, Liu J, Kunos G (2005). "Evidence for novel cannabinoid receptors". Pharmacol. Ther. 106 (2): 133–45. PMID 15866316. doi:10.1016/j.pharmthera.2004.11.005. ↑ Ryberg E, Larsson N, Sjögren S, Hjorth S, Hermansson NO, Leonova J, Elebring T, Nilsson K, Drmota T, Greasley PJ (2007). "The orphan receptor GPR55 is a novel cannabinoid receptor". Br. J. Pharmacol. 152 (7): 1092–101. PMC 2095107. PMID 17876302. doi:10.1038/sj.bjp.0707460. ↑ Munro S, Thomas KL, Abu-Shaar M (1993). "Molecular characterization of a peripheral receptor for cannabinoids". Nature 365 (6441): 61–65. PMID 7689702. doi:10.1038/365061a0. "Cannabinoid Receptors". IUPHAR Database of Receptors and Ion Channels. International Union of Basic and Clinical Pharmacology. http://www.iuphar-db.org/GPCR/ChapterMenuForward?chapterID=1279.